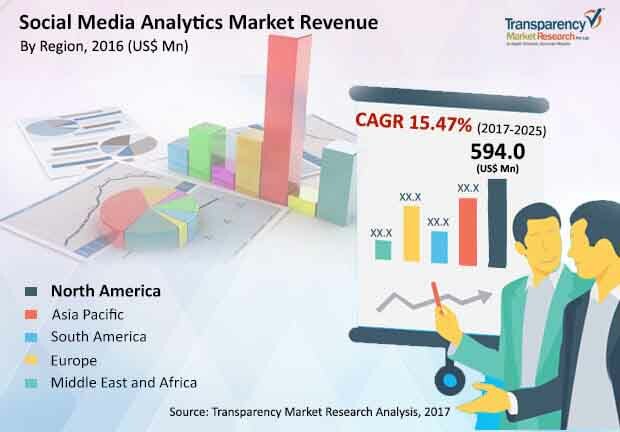 The global social media analytics market is anticipated to showcase a high degree of competition to form a notably fragmented competitive landscape, says Transparency Market Research on the basis of a newly published report. Most players are participating in mergers and acquisitions as a prime strategy to expand their regional horizons. A robust potential present in each social media platform that involves maximizing geographical reach is being utilized by most companies in their analytics programs to generate efficient statistical data. Adobe Systems Incorporated, Talkwalker Inc., Crimson Hexagon, IBM Corporation, Simply Measured, Inc., Clarabridge, Brandwatch, Sysomos, Oracle Corporation, and NetBase Solutions, Inc., are key players operating in the global social media analytics market. The global social media analytics market is mainly segmented on the basis of component, end use, and geographical analysis. Under end-use, chief components are BFSI, retail, telecommunication & IT, transportation & logistics, media & entertainment, healthcare, and education. Of these, BFSI hold a leading position owing to early adoption of social media analytics. Region-wise, the market is spread across North America Europe, Asia Pacific, Middle East and Africa, and South America. Of these, presence of leading competitors in North America has made this region rake in maximum revenue. This market had attracted revenue worth US$2.1 bn in 2016, following which it is projected to garner a total valuation of US$7.8 bn in 2025. Such a splendid gain in revenue is predicted to occur at a stellar CAGR of 15.47% during the forecast period from 2017-2025. Rising popularity of various social media platforms such as Twitter, LinkedIn, Facebook, Snap Chat, Instagram, and many others is chiefly responsible for driving the global social media analytics market. High proliferation of data generated due to a large number of active consumers is required to be managed through a good platform. As social media analytics provides an efficient management system for this purpose, the generated data has provided an impetus for the market to depict an impressive growth in recent years. A phenomenal rise in smartphone manufacturing and their utilization has boosted the global social media analytics market’s potential, which is further expected to continue during forthcoming years. Hence, from an overall perspective, keeping up-to-date with efficient consumer engagement has proven to be beneficial for the global social media analytics market. However, negative anomalies resulting from analytics workflow management has notably hindered the global social media analytics market. Less implementation regarding data processing is a prime reason for negative anomalies to exist, consequently presenting itself as a core obstacle in the market’s pathway. Social media customization regarding media analytics could take a lot of time and be highly tedious and complex, resulting in many companies to get discouraged utilize the analytic programs. Nonetheless, rapid advancements borne out of extensive research and development is expected to substantially neutralize some of these restraints, thus turning the tide for the global social media analytics market’s growth towards a positive growth curve. Rising popularity of various social media platforms such as Twitter, LinkedIn, Facebook, Snap Chat, Instagram, and many others is chiefly responsible for driving the global social media analytics market. Presence of leading players in North America has made this region rake in maximum revenue.